Jodi was diagnosed with an inoperable grade III anaplastic astrocytoma brain tumor on May 15, 2000. Following her initial diagnosis, her neuroncologists in Los Angeles told her that the standard protocol for someone with her condition is to undergo Temodar®, which is a chemotherapy, followed by a course of radiation. 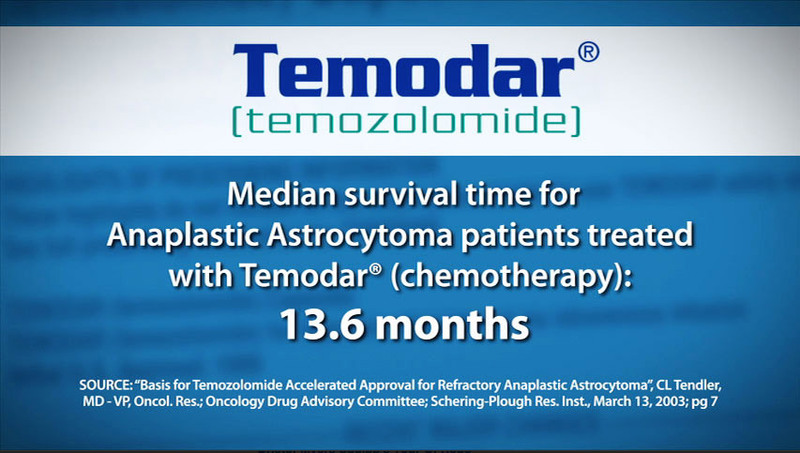 Unfortunately, according to the clinical trials performed that allowed the FDA-approval of Temodar®, the average expected life span of someone with this type of brain cancer using Temodar® is around 13.6 months. After weighing her options, she declined chemotherapy and radiation treatment and choose antineoplaston treatment instead. One month after starting antineoplaston treatment her cancer was gone. She has been free of cancer ever since. Very often, when a story like this is shared with most medical professionals who are unfamiliar with antineoplaston treatment, they usually respond in three ways: #1: She was never diagnosed with cancer to begin with. #2 Any treatment she had before starting antineoplaston treatment is likely what actually cured her. #3: Even if it is true, it proves nothing as it’s merely a single anecdotal case. Note: Jodi’s records are labeled as Jodi “Gold”, which is her maiden name. 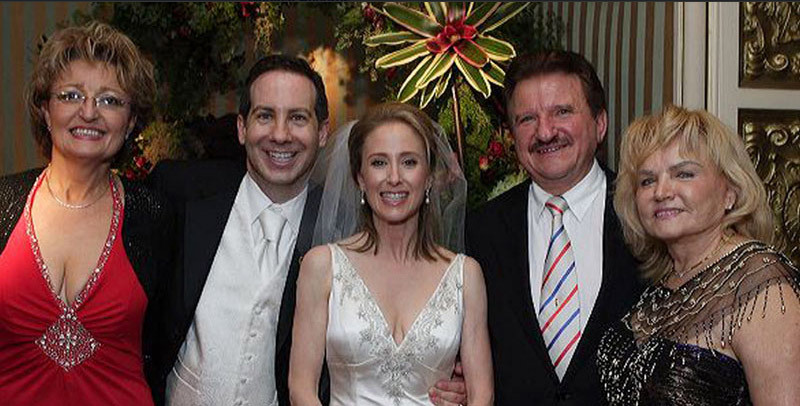 Jodi was married in 2005 with Dr. Burzynski in attendance. Jodi is now known as Jodi Fenton. #1 Diagnosis & Recovery – Jodi’s MRI medical records establishing the presence of a mass in the brain. Jodi’s medial records establishing final diagnosis through biopsy. Jodi’s MRI medical records showing her recovery one month after starting treatment. Dr. Burzynski also had a board-certified radiologist from a third-party review and confirm Jodi’s records [PDF of full records and sources for this paragraph]. #2 Prior Treatment – Jodi Fenton has not received any chemotherapy or radiation treatment to date. 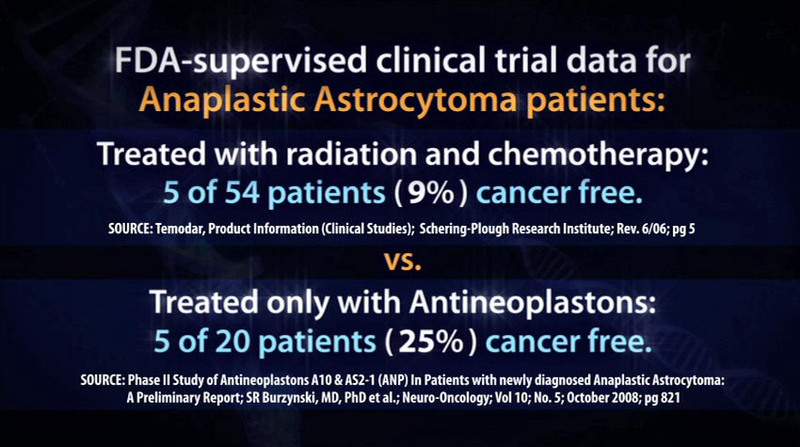 #3 FDA-supervised clinical trial data comparing chemotherapy and radiation treatment to antineoplaston treatment in patients with anaplastic astrocytoma. 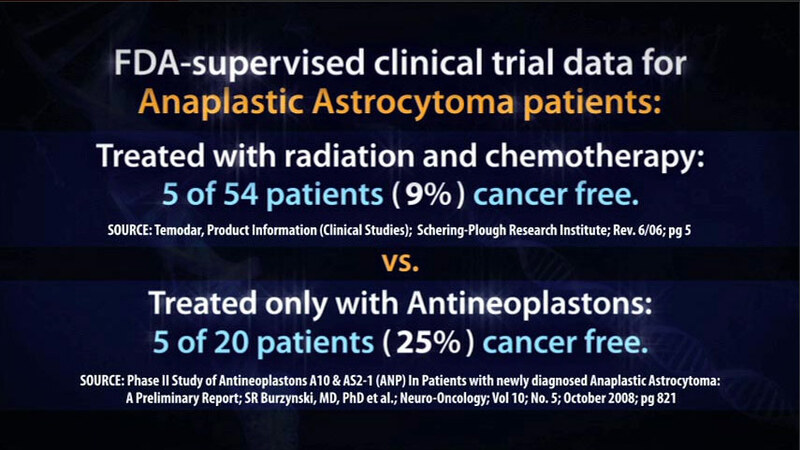 According to FDA-supervised clinical trial data treating anaplastic astrocytoma patients, only 9% of those undergoing chemotherapy and radiation treatment were cancer-free at the end of treatment [PDF page 5]. Clinical trial data treating patients with this condition using Temodar® chemotherapy alone found only 8% of patients were cancer-free after treatment [PDF]. However, these results do not guarantee anyone living a normal healthy life after being subjected to these treatments. The chemotherapy treatment Temodar® offered to Jodi can result in serious debilitating side effects [PDF] or even death [PDF]. Additionally, the concomitant radiation therapy that was offered to Jodi carries the risk of brain necrosis, a condition in which radiation therapy permanently destroys the tissues of the brain, often ending in death one or two years after treatment. Likewise, according to FDA-supervised clinical trial data treating this type of cancer using only antineoplastons, 25% were cancer-free at the end of treatment, with most of them going on to live normal healthy lives—free of harmful side effects. Therefore, Jodi Fenton’s recovery from this type of cancer after being treated with antineoplastons is not a mere anecdotal case [PDF]. One of Jodi’s biggest passions is road bicycling. 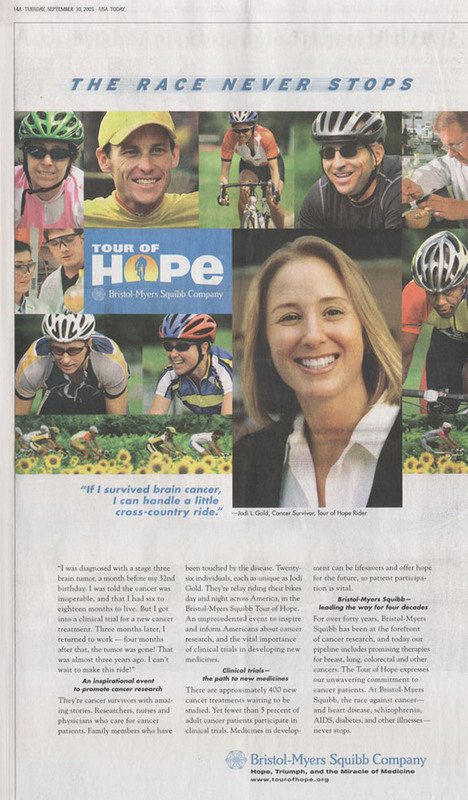 After Jodi was cured and returned to riding regularly, in 2003 she applied to the Bristol-Myers Squibb Tour of Hope bicycle tour hosted by Lance Armstrong – and was one of 26 people chosen to participate in a cross country bicycle tour to promote awareness for participating in clinical trials and cancer research. When being interviewed for a spot on the team she was never asked where she was treated. Considering how remarkable Jodi’s story is, Bristol-Myers Squibb placed Jodi infull page ads in the New York Times, Wall Street Journal, and USA Today to promote the ride. She was interviewed along side Lance Armstrong on CNN. Jodi was soon contacted by a nationwide publication to tell her story (who’s name will not be revealed). During the initial phone interview with this publication, Jodi told the reporter she was treated with antineoplastons at the Burzynski Clinic. The reporter never called her back. Two weeks later Jodi called the reporter back to follow up, the reporter simply told her “we aren’t going to run the story.” Jodi has inferred that the reason they decided not to run her story is because she was treated at the Burzynski Clinic. Jodi was indeed cured in a clinical trial involving new cancer research. However, she was cured using antineoplastons—not a treatment that Bristol-Myers Squibb distributes or any treatment that is produced and distributed by any of the major pharmaceutical companies. Watch an extra clip of our interview with Jodi talking about the Bristol Myers Squibb Tour Of Hope experience. Jodi Fenton’s medical records are published by written authorization by Jodi Fenton. This entry was posted	on Thursday, August 6th, 2015 at 11:50 pm	and is filed under Blog. You can follow any responses to this entry through the RSS 2.0 feed. You can leave a response, or trackback from your own site. Is this anaplastic acrytoma 100% curable?? Whats your condition..at that time?? When you are under chemography amd radition therapy?? How helpful this antineoplaston treatment ?? It depends, but it worked great for Jodi. She didn’t undergo any chemo or radiation. My sister has Anaplastic Astrocytoma. Five months after her diagnosis my mom was diagnosed with a glioblastoma. This is double weird because my mother and sister are genetically related because my sister and I were adopted. My mother had the tumor removed and lived almost exactly 6 months. My sister had her AA removed and statistically can live up to 15 years if I understand correctly. I’m hoping she’ll go see Dr. Burzynski when it shows up again. She and her husband had decided against it as a first treatment because the medical trial was never finished. If the Burzynski movie is accurate, and if I understood correctly, that’s due to Burzynski pulling the plug on it because the FDA not following the agreed on protocol. I’m praying for the Doctor, all those suffering from cancer and all involved. If I had 400 million dollars, I’d personally fund the 3rd medical trial. I also know of a boy from Michigan who is benefitting from the Dr. B’s antineoplaston treatment along with his targeted therapy. People can still get Antineoplastons for this type of brain tumor today. The Phase II trials were completed and published. The Phase III randomized trials were not started yet. They were approved for DIPG, since Antineoplastons are the first medications in human history to cure a DIPG in FDA trials. They have to be conducted independently – unfortunately, no children’s hospital in the USA would allow the FDA Phase III randomized Antineoplastons trials to be conducted on their property. It isn’t Dr B’s fault, nor the lack of funding, it’s the fault of the cancer institutions responsible for taking on these trials.